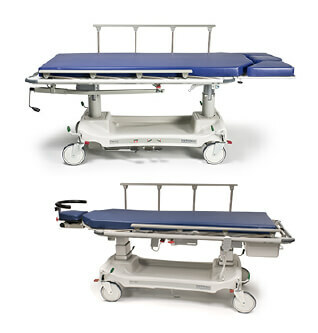 The Powered and Hydraulic Mobile Surgi-Stretcher series is designed to be a single surgical platform for EYE, ENT and Plastic surgery procedures. The low profile head design allows excellent site access for both superior (over brow) and lateral (side approach) procedures. The articulating headpiece with dual operating control knobs allows infinite adjustability and precise microscopic movement of the head section. Low profile headpiece design offers excellent site access for both superior (over brow) and lateral (side approach) procedures. Easy-to-use electric/battery powered or hydraulic/foot-end controlled backrest and leg flex operated controls are available for height adjustment, backrest, leg section, and Trendelenburg/reverse Trendelenburg. A wide variety of surgical accessories can be adapted to the unit to provide versatility. Pre-induction, transport, treatment, and recovery can be performed in the same unit to improve case turnaround and streamline patient handling. Reduces staff time and prevents staff injury involved in transferring patient during various phases of care. With the handheld control, patients can position themselves during recovery, which minimizes staff involvement and can help shorten recovery time. Improves the quality of care and reduces the risk of patient injury by eliminating multiple patient transfers.